Mike Leach named new Washington State head football coach. Folks in Pullman, Wa. had better batten down the hatches and lock up all their fat little girlfriends. Mike Leach has finally found a school willing to hire him as their head football coach. Bruce Feldman reports that Leach will replace Paul Wulff as head coach of Washington State. "Mike Leach has verbally agreed to become the next head coach at Washington State. Leach was offered the position late Tuesday afternoon, CBS learned. The 50-year-old Leach replaces Paul Wulff, who was dismissed Tuesday morning. The hiring of Leach would seem to mesh with Washington State athletic director Bill Moos' comment earlier at the press conference where he announced Wullf's firing that he likes a "flashy, high-octane offense that lights up the scoreboard." No word yet if the Cougar fans who get their Washington State flag in the crowds at every ESPN College GameDay stop will add a skull and crossbones flag to the mix in honor of Leach, but that wouldn't be too much of a shock. Is Derek Dooley's Hot Seat the new Tennessee meme? Tennessee head football coach Derek Dooley has been a meme generator like no other since he took over the job in Knoxville two seasons ago. First there was Derek Dooley's hair, then it was Derek Dooley's hat, and of course, there was Derek Dooley's orange pants. Now in the wake of a less-than-stellar 5-7 season comes the inevitable meme of Derek Dooley's Hot Seat. Athlon Sports asked its contributors if Dooley was on the Hot Seat. Most agreed with the question. Here's the response of Mitch Light. "I believe it’s fair to say that Derek Dooley will be on the hot seat in 2012, his third season in Knoxville. He didn’t inherit an ideal situation at Tennessee, but he has done nothing in his two seasons to prove that he is the long term answer for the Vols. In five years as a head coach (three at Louisiana Tech and two at UT), Dooley has a 16–24 record in conference play. In his two seasons at Tennessee, he is 4¬–12 in the SEC, with two wins over Vanderbilt and one win over Ole Miss and Kentucky. That simply isn’t good enough. His 2011 team was hit hard by injuries, losing star wideout Justin Hunter to a torn ACL in Week 3 and quarterback Tyler Bray to a broken thumb for five games. That can explain some of this team’s struggles, but there is no reason that Tennessee should have had so much difficulty running the ball. The Vols ranked 117th in the nation in rushing, averaging a paltry 90.1 yards per game. That is inexcusable. It’s always dangerous to throw out a number of wins required for a coach to keep his job, but Dooley will probably need to win at least eight games in 2012. Regardless, though, his team needs to look like it has improved — something that can’t be said for each of the last two seasons." An online poll by the Knoxville News Sentinel has more telling information. When asked "Do you approve of the job Derek Dooley did this season?" 74% of the responders said "no." There are also stories of dissension in the ranks within the Tennessee football team. Dooley will probably survive the offseason, but he may have to show vast improvement to survive past a third season in Knoxville, and produce more wins than memes. Dan Mullen blames Penn State rumors on "rival institutions." Mullen has denied the claims, which he called "irresponsible," and placed the blame for the rumors on unnamed "rival institutions." Mullen, in town for the Conerly Trophy presentation dinner, then took it a step further. “I blame it on rival institutions trying to ruin our recruiting which we have dominated in this state over the past three years,” Mullen said." Mullen didn't identify exactly which "rival institutions" he was speaking of. Though schools with a bone to pick with the Mississippi St. program over recruiting quarterbacks (Auburn), or getting embarrassed by the Bulldogs several years in a row. (Ole Miss) come to mind for some reason. Of course it should be noted that Urban Meyer denied talking to Ohio State before he was named Ohio St. head football coach. So take that as you will. Just don't believe every backwoods TV and radio station when they report a story like this. Georgia Bulldogs muzzle Isaiah Crowell and Carlton Thomas. Crowell in less troubled days. Don't expect to hear much from Georgia troubled tailbacks Isaiah Crowell and Carlton Thomas in regards to the upcoming SEC championship game against LSU, or on any other subject for that matter. 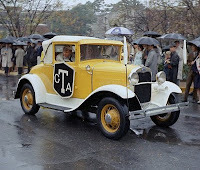 Georgia has make them off-limits to the media, according to The Macon Telegraph. "We will continue to have extensive coverage this week, but don't look for any comments from the Georgia tailbacks. We were informed yesterday that Isaiah Crowell, Carlton Thomas, Ken Malcome ... the whole group is off-limits this week." With the amount of time Crowell and Thomas have been in Mark Richt's doghouse this season, this should come as no shock. It does lead to questions about whether the two troubled tailbacks' future next season at Georgia. Covering Dixie Like Mildew: Trent Richardson, Gus Malzahn, Jarvis Jones, and more. Big talk of the day. More Gators leaving the sinking ship? Crossing the Atlantic: Georgia Tech, Frank Spaziani, Clemson, and more. Six of one, or half a dozen of the other. Well, somebody had to to do it. Dan Mullen a candidate to replace Joe Paterno at Penn State? 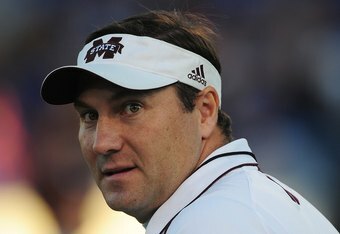 Don't look now, Mississippi State, but another school may be eying Dan Mullen. Black Shoe Diaries, a Penn State-centric blog, picked the Mississippi St. head football coach to start off its profiles of possible candidates to replace Joe Paterno. And talk on Twitter is that Mullen might be in serious contention for the job. Here's some of what Black Shoe Diaries said about Mullen. "Dan Mullen was born in Philadelphia, raised in the northeast, and went to college at Ursinus. Besides either A) Having direct Penn State ties, or B) Direct ties to other major programs in Pennsylvania, that's about as good a personal/cultural fit as we'll find. Mullen hasn't been connected to any major NCAA violations, and the only blemishes on his record as a head coach are in the form of a few secondary violations that seem more like administrative missteps and miscommunications than anything nefarious. Another point to be considered: Mullen is a longtime friend of Urban Meyer. He may relish the opportunity to compete head to head with his mentor every year. The question is whether he'd leave the SEC to come up north. I think he would. Penn State is a step up from Mississippi State in terms of resources, facilities and support - even in spite of recent events. I think at this point, Mullen has to look at the teams he's competing against in the SEC West in Alabama, LSU, Arkansas and Auburn, and think that he'll never have the same amount of ammunition as them. The ceiling in Starkville is low, and at some point soon he's going to try to move up the ladder. Penn State may very well be that move." There may be more to the Mullen to Penn St. meme than just the Christmas List from a blog. Fooball Rumor Mill tweeted that Mullen is being looked as "a legit candidate at Penn State." Whether that's true or not, Mullen is and will continue to be a popular name on the wish list of any school looking for a new head football coach. And Mississippi State might not be able to keep him in Starkville if the right school comes calling. Big Tentacles: Urban Meyer, Luke Fickell, Brady Hoke, and more. 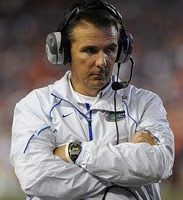 The Hitchhiker's Guide to Urban Meyer. Tired old commentary of the day. And what of Luke Fickell? Michigan deserves a spot in a BCS bowl. Brady Hoke not worried by Urban Meyer coaching Ohio State. What does the head football coach of Ohio State's number one rival think of Urban Meyer's hire as Buckeye head football coach. 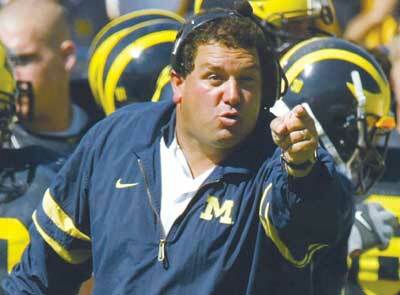 Brady Hoke acts like he's not too concerned about it. "He's not going to play a down and neither am I," Hoke said. "Me, knowing Urban, he's a good football coach, good guy, going to welcome him in. But this is still Michigan and Ohio and it's still going to be that rivalry and neither one of us is going to play a game." Where the coaches might matter more is on the recruiting trail. In Hoke's first full class, he so far has nine commitments from Ohio. Hoke wouldn't say that Meyer's arrival will make it more difficult for Michigan to recruit. "I don't think that matters," Hoke said. "There's a lot of respect, two tremendous universities." Hoke does seem to be worried too much about Michigan's number one rival being coached by a man with two BCS championships on his resume. This could just be an effect of Michigan's first victory over Ohio State since 2003. 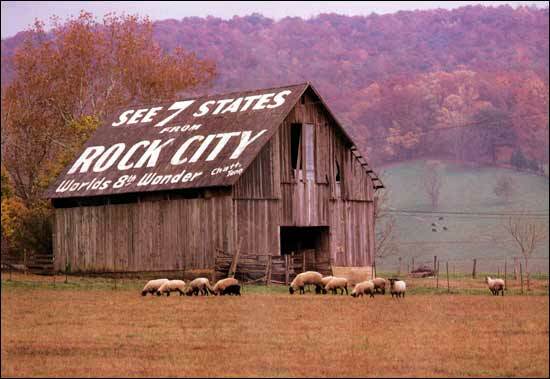 Hoke certainly doesn't seem to be shaking in his boots over this. Time will tell how he's feeling when Hoke and Meyer face each other in 2012. Urban Meyer is Ohio State head football coach. It looks as Urban Meyer is all but officially the new head football coach of Ohio State. Meyer's agent, Trace Armstrong, has confirmed the story. According to his agent, Urban Meyer has agreed to become the next head coach at Ohio State University. No word yet if Kirk Herbstreit will be following Meyer to Ohio State as his quarterback coach, however. Unquiet on the Western Front: Dennis Erickson, Rick Neuheisel, Andrew Luck, and more. UCLA needs to fire Rick Neuheisel. The obligatory Mike Leach to ___________ story of the day. Welcome to the Fallout: Urban Meyer, Derek Dooley, Trent Richardson, and more. Urban Meyer is still not Ohio State head football coach. Nick Saban would give the Heisman Trophy to Trent Richardson. We've got to start meeting like this. Ohio State to play Florida in the Gator Bowl. The UCLA-Oregon Pac-12 championship game is a farce. Ron Zook is an ex-Illinois head football coach. Ron Zook once again in the familiar position of being an ex-football coach. Illinois has reportedly fired Zook, in his seventh year as head coach of the Fighting Illini. Illinois started out the year 6-0, before an epic 0-6 collapse in the second half of the season. Zook's record as Illinois head coach was 34-51. Andrew Luck shows off his best Heisman Trophy stance. You won't be seeing Urban Meyer on ESPN this weekend. Let the conspiracy theories commence! Urban Meyer will reportedly not be appearing on any of ESPN's college football related broadcasting this weekend. This reportedly comes at the request of Meyer, who had been the subject to rumors all week that he and Ohio State had reached a deal that would make him the Buckeyes' next head football coach. Game Day Goulash: Tyrann Mathieu, Rex Burkhead, Isaiah Crowell, and more. The Honey Badger doesn't give a **** about Arkansas. Miami and first-year head football coach Al Golden agree to a four-year contract extension. Florida - FSU is not "The Salvage Bowl." Game Day Goulash: Trent Richardson, Denard Robinson, Urban Meyer, and more. And the horse you're riding out on. Everything counts in large ammounts. Heisman hopes on the line. The Leaser of the Pack. Thanksgiving Game Day Goulash: Texas-Texas A&M, Les Miles, Andrew Luck, and more. We'll meet again. Don't know where. Don't know when. 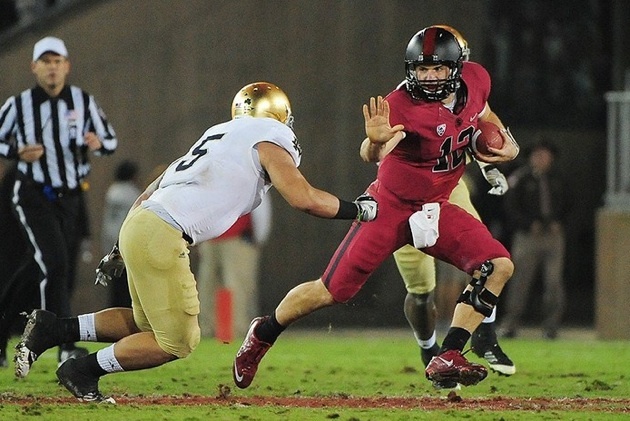 Andrew Luck isn't enrolled for next quarter at Stanford. LSU can handle big games. So I am thankful that I'm incapable of doing any good on my own. Links in a chain passed down through the years. The Big Ten isn't strong enough for the BCS. They're just not into you. Is Urban Meyer becoming Schrodinger's Kitten? A kitten (or cat) is locked is locked in a box built to detect the decaying of an atom of radioactive material. If the atom decays, a vial of poison is released and the kitten dies. If it doesn't the kitten lives. However the observer of the experiment doesn't know if the experiment has been proven or not. So it can be said that the kitten is both alive and dead while the box is unopened. What's that have to do with college football? Well in some cases the rumors surrounding coaches or possible coaches jobs can cause bizarre paradoxes to occur, in which a person both is and isn't a head football coach at any given moment. This is the situation surrounding Former Florida head football coach/current ESPN analyst Urban Meyer, and his possible taking the head coaching job of the embattled Ohio State football program. 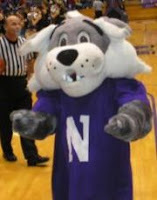 Rumors are circulating that Meyer has accepted an offer from the school, which Meyer has denied is happening. Reports have claimed that Meyer is waiting for Ohio State's rivalry game against Michigan to make it official. Meyer, it seems, reportedly doesn't want to step on current head football coach Luke Fickell's fingers quite yet. Meanwhile Meyer continues to deny the story is happening. So what we have here is a classic Schrodinger's kitten moment where Urban Meyer may or may not be the next Ohio State head football coach. It's a paradox which will eventually be solved, but as for now, Ohio State head football coach Urban Meyer is neither alive nor non-existent. Covering Dixie Like Mildew: Derek Dooley, Tyler Bray, Mark Richt, and more. Now do you know how to reach Planet BCS? Well, I wish you'd explain it to me some time, buster! Tennessee will not be playing Ohio State in 2018 and 2019. I beat the crap out of Tulane for this? Mr. College Football remembers the Voice of the Georgia Bulldogs. 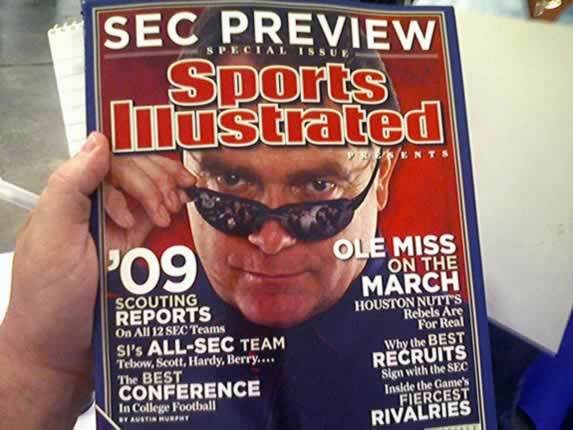 Monday marked the two-year anniversary of Ole Miss' last win in the SEC: a 25-23 win over LSU on Nov. 21, 2009. Since then, it's been nothing but pain and woe for the Rebels. This Saturday's game against in-state rival Mississippi State will probably mark the second straight season without a win for Ole Miss. Two years doesn't seem like a long time, but a lot has happened since then. 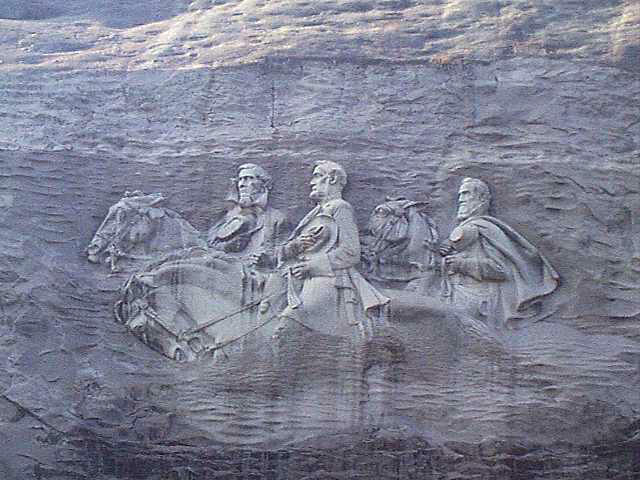 This is what the world looked like the last time Ole Miss won in the SEC. 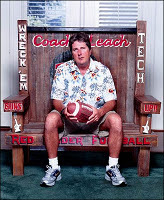 Mike Leach was head football coach at Texas Tech. Reggie Bush was a Heisman Trophy winner. Jay Mariotti was the voice of morality in sports on Around the Horn. Moammar Gadaffi was in charge of Libya. "Fireflies," by Owl City was the number one song in America. Conan O'Brien was still on NBC. Lane Kiffin was head football coach at Tennessee. Charlie Sheen was still on Two and a Half Men. Ben Roethlisberger could still enter bars in Milledgeville, Ga. The Democrats had a majority in Congress. Brett Favre was looked up to as a family man. Prince William was a bachelor. The Winnipeg Jets were the Atlanta Thrashers. Big Tentacles: Urban Meyer, Brady Hoke, Bret Bielema, and more. Urban Meyer is still not the new head football coach of Ohio State. US Senate to hold hearing on Penn State scandal. Ohio State-Michigan should not be moved to earlier in the season. Dubious achievement of the week. Derek Dooley talks about that Tennessee victory celebration video. The video of Tennessee's post-Vanderbilt locker-room victory celebration has taken the internet by storm. Naturally, some enterprising reporter brought it up to the Vols' head football coach, Derek Dooley during his Monday post-game press conference. The fun starts around the 1:24 mark. His Hairness didn't apologize directly for that four letter word you wouldn't want your four year old to say. He did seem more annoyed that the video got out. ("A sacred place? Really, Precious?) Which is of course standard operating procedure for any blossoming college football scandal. Covering Dixie Like Mildew: Larry Munson, Trent Richardson, Les Miles, and more. It's getting closer every day. I've never had to, but I better knock on wood. 'Cause I know someone who has. Alabama would "be better off" if it didn't play for the SEC championship. Derek Dooley has a potty mouth. Tennessee really hasn't had much to cheer about this season. The team has underperformed mostly due to the right thumb injury to star quarterback Tyler Bray and the Justin Hunter's season-ending ACL injury. So when the Vols manage to salvage their bowl game hopes and prevent a shutout against SEC opponents by defeating Vanderbilt 27-21, it's excusable if the team gets a little emotional. How emotional? Emotional enough for Tennessee head football coach Derek Dooley to drop his usual proper attitude and say one of those words Mama Barbara would probably put him across her knee and spank him for. A victory against Vanderbilt may not seem much to get overexcited about, but in a season that hasn't had much to talk about outside of Derek Dooley's choices in apparel, you get your reasons to celebrate when you can. Former Georgia announcer Larry Munson passed away Sunday night. He was 89. It's hard to really describe what Munson meant to Georgia. For 42 years, he described the happenings on the field to the Bulldog Nation from the confines of the announcer's booth. 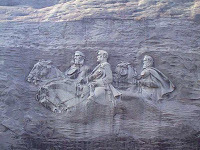 The best way to explain why Munson was such an integral part of Georgia life for four decades is to let him speak for himself. Condolences to the Munson family and to Georgia fans everywhere. "Virginia Teach" invades the Orange Bowl? 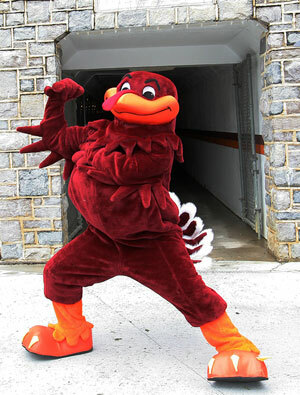 Virginia Tech won't be amused. I know the BCS picture is looking real messed up right now, but I didn't know who messed up it was until I read Jerry Palm's bowl predictions. It should be noted that Palm has LSU vs. Alabama in the BCS title game, Michigan vs. Houston in the Sugar Bowl, Oklahoma State vs. Stanford in the Fiesta Bowl, and Wisconsin vs. Oregon in the Rose Bowl. ESPN is so happy with itself getting the rights to the BCS right now. 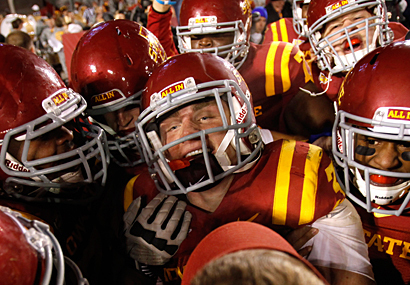 Game Day Goulash: Oklahoma State-Iowa State, Trent Richardson, Urban Meyer, and more. If your a pediatrician in or around Ames, Iowa, I'd get ready for a spike in business in the next nine nine months. Along with a spike in births. Opportunity Knocks for Trent Richardson? Georgia (Dome) On My Mind. And I would run 500 yards . And I would run 500 more. Just to be the man who ran a thousand yards to fall down at your door. Food for thought on Penn State. The Washington Post's Colbert I. King writes on how the Jerry Sardusky scandal at Penn State needs to stay focused on Sardusky's alleged criminal actions instead of the hoopla surrounding the scandal. Covering Dixie Like Mildew: Dan Mullen, Brandon Boykin, James Franklin, and more. Could things get any worse at Auburn? Pain Lies by the Riverside. Dan Mullen taking notes from the competition. Bad Analogy of the Day. 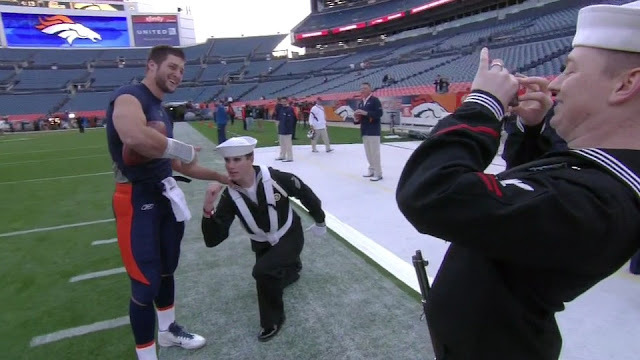 Your Ricky Stanzi "America, Love It Or Leave It" Moment of Tebowness: Tim Tebow Gets Tebowed by a sailor. It's been a while since I did either a "Your Moment of Tebowness" post or a "Your Ricky Stanzi "America, Love It Or Leave It Moment of the Day" post. Mostly since I decided to put the blog's focus more on college football than on general sports. So to rectify that situation, here's a mash-up of both SWRT classics with His Tebowness getting personally Tebowed by one of America's defenders from the US Navy. You can't get any more American than that*. 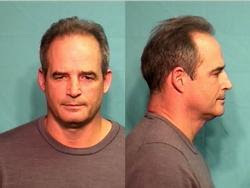 Missouri head football coach Gary Pinkel arrested for DWI. Say that you're the president of the University of Missouri. You're still in the afterglow of the Best Week Ever where your school joined the SEC, and beat Texas. 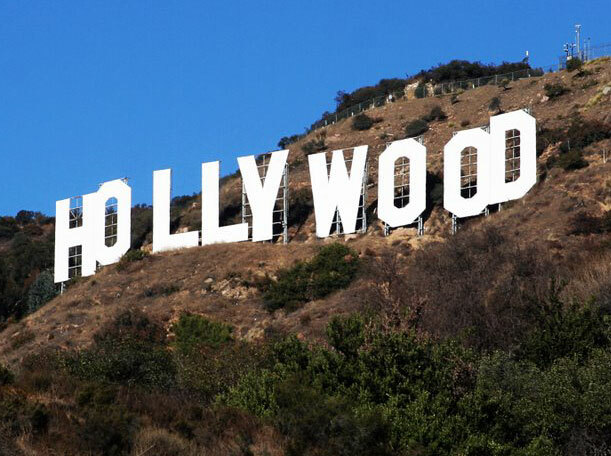 What could possibly get you down outside of a Jerry Sandusky-level scandal? Well, hearing that your football team's head coach, Gary Pinkel, had been arrested for a DWI charge, probably would. "COLUMBIA - KOMU 8 has confirmed Boone County sheriff deputies arrested MU football coach Gary Pinkel Wednesday night for DWI. Pinkel posted a $500 bond and was released from the Boone County Jail." Yeah, that's not the kind of thing you want to hear when you walk into the office first thing in the morning. But at least you're schools quickly adapting to the SEC's culture of drinking schools with football problems. Covering Dixie Like Mildew: Gus Malzahn, Tyler Bray, Aaron Murray, and more. The Gus Malzahn to Ole Miss meme is on the march. South Carolina can still end up having a 10-win season. 60 minutes of 40 Minutes of Hell. Behold! The Tennessee Vols' orange ceramic dog! An image of the orange ceramic dog that Tennessee head football coach Derek Dooley has brought to practice has finally shown up via CBS Sports. The dog is supposed to help Dooley's struggling team deal with negative energy. Having it moved around the practice field on a dolly is a little odd, though. On the other hand, if it was pushed around on it's own little cart, or even worse, it's own golf cart or ATV, people might start to question His Hairness' sanity. 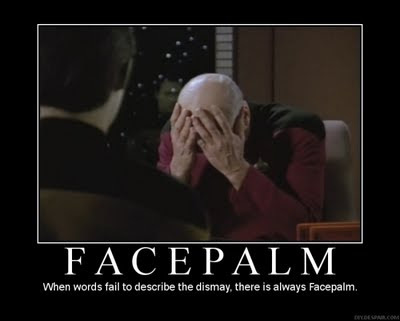 (Like they didn't do that with the "Rommel" press conference. Then again, people might just write it off as being Vince and Barbara's kid. Peyton Manning as new Ole Miss head coach is the insane rumor of the day. Most embarrassing Peyton manning image I could find. It was something that probably had to happen sooner or later. 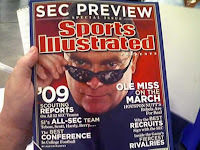 A rumor started floating around that Ole Miss might be interested in the services of currently injured Indianapolis Colts quarterback Peyton Manning to replace Houston Nutt as the school's head football coach. Pey-Pey's obvious family connections to the school (father Archie Manning and little brother Eli) paid a big part of this totally but-nuts idea. Of course, there's not a single shred of reality behind it.Archie Manning has already shot the story down. You think that would put an end it all of this, but it probably won't for at least a day or two. 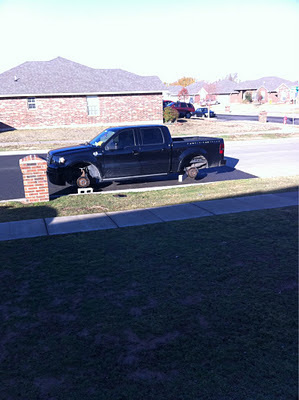 Landry Jones' personal Sooner Schooner, sans tires. What sounded at first like it was a simple prank is turning out to be something of a more serious (and quite real) crime. Yesterday, Oklahoma quarterback Landry Jones posted an image of his truck on Twitter, sans tires. At first it sounded like it was a typical college prank. But now it seems that yes, the Sooner star QB was the victim of a crime. "Turns out … his tires really were stolen. I (The Oklahoman's Travis Haney) just ran into one of his teammates while I was eating lunch, and he told me the strangest part of this is that everyone thinks it’s a joke. But Jones’ tires really were taken from his truck at some point early Tuesday morning." Well, that's a bummer. Jones has already gotten new tires, and should probably be thankful that nothing more serious was taken (like the whole freakin' truck). I know the term "Sooners" refers to the land grab when the territory was open to settlers, but this is ridiculous. China desert lines mystery solved by Boston College helmet. 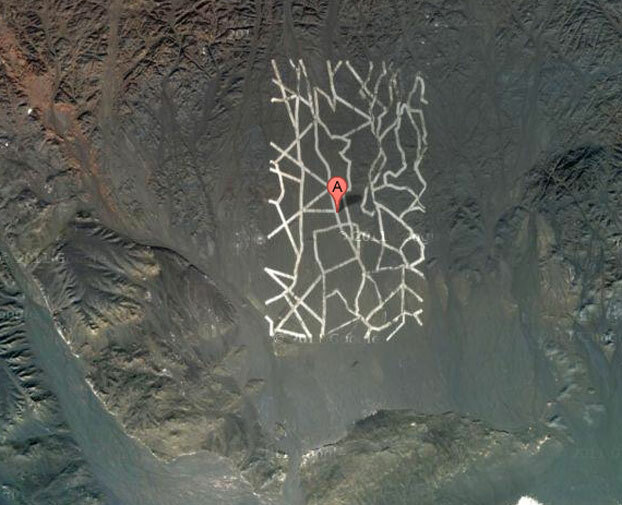 You have probably heard by now about the mysterious grid-like lines discovered in the China's Gobi desert. What they're supposed to be has been the source of much discussion on the internet. 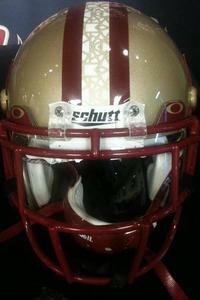 The "stained glass" stripe on Boston College's helmets. Well, that or the Chinese Communist government is trying to create its own ginormous version of The Pattern from The Chronicles of Amber. Or maybe it's the Pattern's Courts of Chaos counterpart the Lorgus. Urban Meyer will not be the next Arizona head football coach. Who wants to be the next Arizona head football coach? Not Urban Meyer, apparently. Reports claim that the former two-time BCS championship winning Florida head football coach had talked about the position with Arizona athletic director Greg Byrne. Meyer has since decided he's just not into the idea of coaching the Wildcats. "According to a Tuesday report from the New York Times, Byrne and Urban Meyer met in Miami "early last week" to gauge Meyer's potential interest in the Wildcats' head coaching position. The meeting ended with Meyer reportedly "intrigued" by the potential offer. Apparently that interest didn't last long; Meyer then telephoned Byrne Monday to tell him he "was not going to pursue the job," the Times reported." So what are Meyer's future plans? It probably doesn't involve going the John Gruden route at ESPN. Meyer has been constantly linked to the Ohio State head coaching job ever since Jim Tressel's resignation. Talk of Meyer replacing Joe Paterno at Penn State was brewing even before the Jerry Sandusky scandal broke. Wherever he lands, the hype macing is bound to be work overtime. 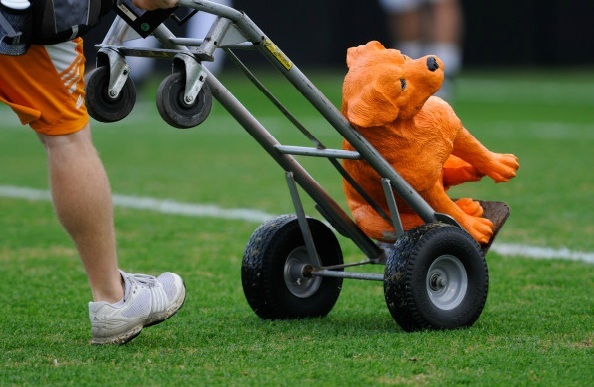 Derek Dooley brings an orange ceramic dog to Tennessee practice. Derek Dooley's madness knows no ends. It time to add another icon to the growing carnival of the absurd that is the Derek Dookey era at Tennessee. This time, His Hairness has added an orange-colored ceramic dog that Tennessee equipment manager Roger Frazier discovered in Sweden. Apparently a live bluetick coonhound and a cosplaying counterpart weren't enough canine representatives for His Hairness. Dooley means for it to be a symbol of positive thinking for his struggling team. "The significance of the dog went back to a metaphor Dooley provided the Vols (4-6, 0-6 SEC) with on Sunday, one day after their worst loss of the season, a 49-7 rout at Arkansas. 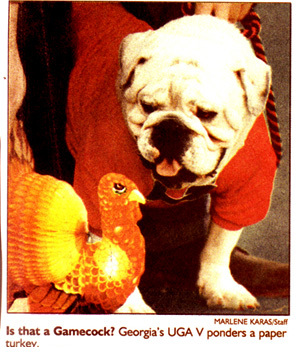 Along with throwing out the Arkansas film, Dooley told the players to feed the "orange dog," which symbolizes positive thinking, and not the "red dog," which symbolizes negative thinking. "You're missing that juice, that confidence and every day you wake up, you've got one side that wants to be negative and wants to feel sorry for yourself and wants to make excuses and blame others. Then you've got another side who thinks good thoughts and has a lot of encouragement, is a little more solution-oriented and isn't so emotionally drawn to the results. That's the side we need to feed ourselves with, and that's hard to do, it's hard for all of us." The fact that red is a team color of many of Tennessee's rivals (Alabama, Georgia, Arkansas, etc.) that the Vols' have fallen to this season is probably not coincidence. The idea does sound hauntingly familiar to Gerogia head football coach Mark Richt's talk of 'the energy bus" and "energy vampires" from before the start of the season. The orange ceramic dog joins Derek Dooley's hair, his hat, his orange pants, and his mother as symbols of what has already become a surreal era of Tennessee football history. Oh, and don't forget that hideous tat on Tyler Bray's back. No matter what the win-loss records eventually comes out too. Dooley's time in Knoxville will soon not be forgotten. Joe Paterno's Tuesday news conference scrubbed. What's ESPN's concern in the Penn State scandal? Is LSU Lost in the Supermarket? The Big East to get bigger, but less East-ier?